A longer version of this essay will be presented at the Hannah Arendt-Reiner Schurmann Memorial Symposium at The New School for Social Research in New York City, April 21-22, 2016. On October 24, 1973, the Egyptian military, under the command of General Hosni Mubarak, and under instructions from President Anwar Sadat, dealt an unprecedented blow to the most powerful regime in the Middle East: Israel. As the Egyptian army crossed the Suez Canal and established bridgeheads in the Sinai peninsula, it changed the fortunes of a hitherto shaky Egyptian presidency. Until this victory over IDF forces, Sadat had struggled to appear as the legitimate heir to the iconic Gamal Abdel Nasser, but this victory, which wiped out the stain of defeat of 1967, in one stroke turned Sadat from a hesitant, accidental president into the batal al-‘ubur or Hero of the Crossing. This event and this moniker were all the more significant in light of what followed. 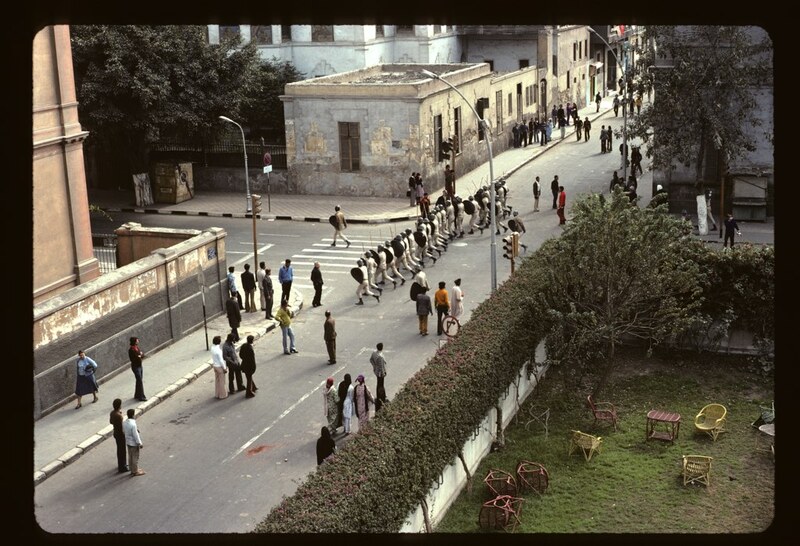 Four years later, in January 1977, bread riots erupted in the major urban centers of Egypt. People stormed the streets of cities like Alexandria and Cairo, mocking the great military hero Sadat with chants of: “wain al-futur, batan al-‘ubur?” or “Hero of the Crossing, where is our breakfast?” Sadat, at the urging of the World Bank and IMF, had just cut food subsidies in Egypt. The effects of the infitah (economic opening) were coming home. A strikingly similar tableau involving food and popular anger played out in Algeria in 1988 when popular uprisings paralyzed major Algerian cities. Young Algerians, bearing a newly coined term, hittistes, smashed the shopping malls of the rich, set fire to shops, and in a final act of deeply symbolic rebellion, tore down the national flag and raised an empty couscous sack in its place. 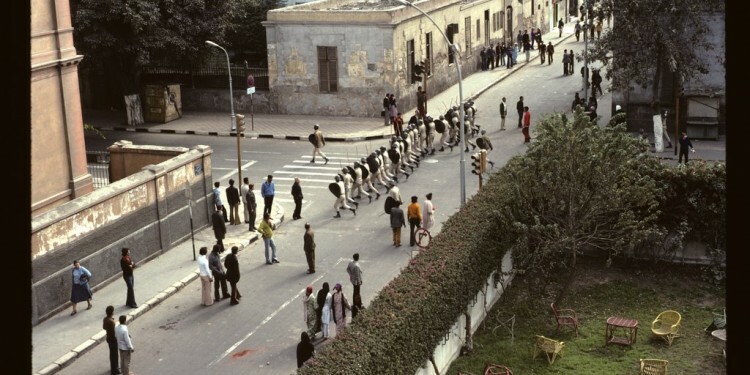 Similar riots protesting brutal price increases in basic commodities erupted globally throughout the 1980 and 1990s: in Morocco in 1981, Mexico in 1983, Jordan in 1989, Argentina in 1989, and Indonesia in 1998, to give some of the more prominent examples. It was neoliberalism’s finest hour. For the last forty years, neoliberalism has waged a class struggle against the global working class in two related ways: by breaking unions in workplaces (the point of production) and by attacking the food, shelter and social services workers need to survive (to replenish their labor power). Once capital was successful in achieving the first objective, much of working class struggle in the neoliberal period shifted to the sphere of the second — fights for food, water, shelter, schools and healthcare. The sphere of social reproduction, or the reproduction of labor power, then, needs to be taken seriously by the student of revolutionary strategy. It is dangerous for the left to ignore this aspect of the lived experience of the working class, limiting its conception of working class struggle to a battle over wages and working conditions alone. It is now widely acknowledged that since the high point of labor struggles in the 1970s, capital’s main goal at the point of production has been to break all advanced and even rudimentary forms of working class organization. Union density has fallen drastically since in the 1980s in virtually all OECD countries, with the US leading the trend. In New Zealand, union density halved in the 1990s alone. In the global South, similarly, according to the ILO, unions declined in key centers of global production, such as Egypt, Argentina, Venezuela, Pakistan, Sri Lanka, Singapore, Thailand and Mexico. The second strategy of capital, which began simultaneously with the first, has been to attack, through austerity, the working class’s ability and means to socially reproduce itself. The best account of this process is provided by Joseph Stiglitz, former chief economist to the World Bank, who defected from “the dark side” even before the economic collapse of 2008-2009. The World Bank, Stiglitz confides, surveys the national economy of a country and hands their ministers a three-step program. The first step is to privatize state industries. Several previously state-run water and electricity companies have thus been sold off to multinational corporations while local ruling classes come up with ever more fanciful reasons to justify the sell-off and ever richer payoffs from such sales. The biggest privatization deal of the 1990s, according to Stiglitz, happened in 1995 when US-backed oligarchs stripped Russian national assets. The second step is opening up or liberalizing the national market, which allows investment capital, often in real estate and currency, to flow in and then, as demonstrated in the case of Indonesia and Brazil, flow out at the first signs of trouble, taking national reserves with them. To woo these loan sharks to return a nation’s capital funds, the IMF then forces states to raise interest rates, often as high as 50 and 80 per cent. The result is predictably the destruction of property values and industrial production. But there is a Step Three-and-a-half that closely follows the first three, which Stiglitz has called “the IMF riot” — the massive social unrest provoked by these measures. Despite the proliferation of literature on social movements and revolution in recent years, struggles for subsistence have only received what might be called “sectoralized” scholarly attention. For instance, while there is a rich literature on food riots or grain riots, going all the way back to scholars such as George Rudé, this scholarship is disciplinarily sequestered from studies of labor mobilization, unionization or the newer studies of the neoliberal phase of capitalism. This is unfortunate for two reasons. First because, as Stiglitz’s account shows, history does not allow for the neat separation of economic and social effects. Second, because it is in these spheres of life-struggles that we can often sense the full rage, combativity and hence potential of the working class as a whole. Men, women and children, pushed to their limit by capital, take to the streets to test the limits of capital. But why shouldn’t the workers’ wives and mothers of soldiers she studies be considered part of the working class? 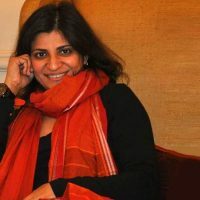 Recent scholarship on social reproduction theory is significant precisely because it helps overcome such narrow definitions of class (a legacy of the second international in many respects) that shackle the power of class as an analytical and political category by conflating it solely with the industrial working class, or with the waged worker alone. There are two issues at stake here: one, why an understanding of how labor power is produced under capitalism is key to an understanding of the working class; and two, how this is a strategic understanding of class which has the power, even during reformist or defensive struggles, to “breach the boundaries of bourgeois acceptability” (Neil Davidson, How Revolutionary Were the Bourgeois Revolutions? Haymarket Books, 2012). At the risk of oversimplification I will summarize briefly the key points, which I argue at greater length in a recent essay. First, social reproduction theory clarifies that the labor power of the worker is produced outside of capital’s circuit of commodity production. Michael Lebowitz has rightly called this the “second moment” in production (Beyond Capital: Marx’s Political Economy of the Working Class, Palgrave McMillian, 2003). While the nuclear family still endures as the primary site for the production of labor power, we also have to be attentive to institutions of health care, education, transport, and pension systems — often collected under the term “social services” — where the worker’s labor power is socially produced. Second, disrupting the circuit of commodity production is not enough to annihilate capital as a whole. Narrowly economistic struggles that limit themselves solely to the workplace leave aside the task of confronting “capital in general,” and thus limit the power of the working class as class. Finally, neoliberalism’s fairly successful attack on trade unions has meant a relative decline in struggles at the point of production since the 1970s. But this does not mean that the global working class has not responded to the injuries wrought upon it by capital. Several militant battles have erupted around social reproduction, where working class communities have agitated for decent living conditions (as opposed to wages), including the food riots cited above, protests against water privatization (in Cochabamba and Ireland) and against land eviction (India), and struggles for fair housing (the United Kingdom). Social reproduction theory restores the original Marxist insight about the integrated nature of the production of commodities (value) and reproduction of labor power, and therefore allows us to take a fresh look at such subsistence struggles. It illuminates what Marxists of a different era knew so well, that struggles to defend, improve and extend the lives of the working class also carry the power to breach the separation between social and political struggles enforced by bourgeois democracy. “From criticism,” writes Trotsky in his magisterial study of the Russian Revolution, “the masses pass over to action. Their indignation finds expression first of all in food disturbances, sometimes rising to the height of local riots.” The Russian Revolution, like the French Revolution before it, began with women rioting for bread.